2013 shall be the year of the Geniuses, according to Christofer Sundberg of Avalanche. 2013 shall be the year of the Geniuses, according to Avalanche's Christofer Sundberg, and he says Avalanche tries to come up to that standard. "As in try by actually working hard on sandbox games and biz models," he went on to Tweet, "not just Tweeting and yap in GDC talks." With that, he Tweeted yet another teaser picture of his unnamed sandbox project, which may - or may not - be the next episode in the Just Cause franchise. Judging by a subsequent Tweet, the true identity of this title will be revealed at E3 2013. However if the 'we-almost-saw-a-hook shot' in the photo is any indication, the odds are this is a Just Cause title, and not, say, Fluffy Bunnies Go Back To Rainbow Lake. 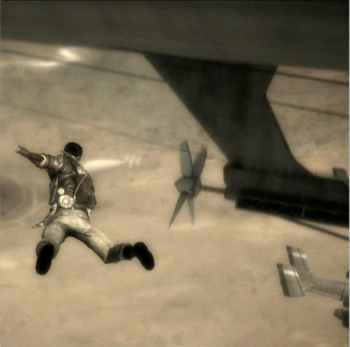 Way back in the mists of 2010, in the wake of glowing reviews and great sales numbers for Just Cause 2, Sundberg said that Avalanche was very keen to work on Just Cause again. "I personally wrote the original pitch for the game in early 2003," Sundberg said at the time, "so it's something that means a lot for me and for the people in this studio. This studio lives and breathes the Just Cause franchise, and handing that over to another developer would spoil it." Looks like we'll get to see what Sundberg's been breathing soon enough.